Between the season of dirty snow piles and the season of steaming garbage piles is the perfect time to hang out on your roof. New York winters can be brutal, but the good news is the summers are also unbearable. They say you don’t live in New York City for the weather. Or the rents. Or the quality of living. Why do we live here again? Because the people are hot and there’s plenty to complain about. Also, I will begrudgingly admit, we live here for that grace period between the season of dirty snow piles and the season of steaming garbage piles when the weather is actually nice. One could even say it’s lovely, but as a New Yorker I refuse to use such a saccharine word. This grace period usually lasts about three weeks, sometimes four during a good year. “Scientists” call this “spring,” but I call it Temporary Bliss That Will Inevitably End. During this time, it’s crucial to spend as much time as possible outdoors. We usually lock ourselves inside, shielded from the light, heat, or cold, but during the spring we’re blessed with weather that feels good to expose our vulnerable bodies to. That’s why during these weeks the city seems like it’s buzzing. New Yorkers shed their winter layers, restaurant patios are open and full of people…and, oh, my God, are they smiling? 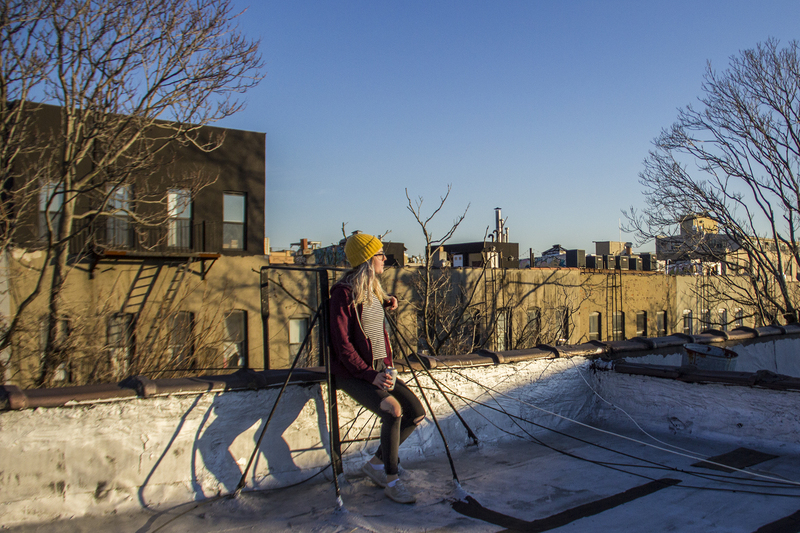 Bars with backyards are alluring, but there is a much cheaper, more convenient option: drinking on your own rooftop. Enjoying the great outdoors in the greatest city on earth usually means drinking outside. That’s about as far as most New Yorkers are willing to go in terms of soaking up nature. If you ever suggest going on a hike, you will be exiled upstate to start a family. Anyway, back to drinking. Enjoying beverages outside can get expensive, especially if you’re good at it. And while bars with backyards are alluring, there is a much cheaper, more convenient option: drinking on your own rooftop. Or drinking on your friend’s rooftop. Or drinking on the rooftop of that guy you hooked up with once. The drinking possibilities are endless, as many people have access to their buildings’ roofs. Getting to the roof is easy! All you have to do is climb the precarious fire escape that isn’t properly attached to the building wall, or open an emergency trap door that is sealed by cobwebs. Simple as that. Once you’ve made your way up to the roof, you’ll get to experience the city in the best way: separate and apart from everyone else. There’s a reason rich people prefer penthouses, and it’s not just for that cool thing where the elevator opens right into their apartments. Up on the roof, you are on top and you can see exactly where you are. The city skyline is on your level, the noisy streets are down below, and the stars are right above you. Well, you just have to trust that they are; it’s too hard to see them through all of the pollution. 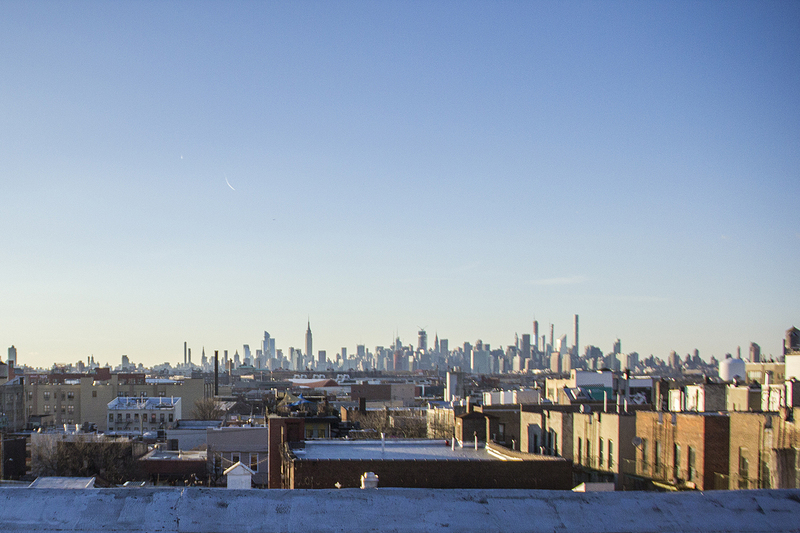 From up here, the city is your oyster. Suddenly a place that can often feel so overwhelming feels like your kingdom, especially with everyone craning their necks looking up at you from below. Crack open a beer, soak up the sweet spring breeze, and look out at the city you have temporarily conquered. You made it. Sure, tomorrow you’ll wake up in the closet you converted into a bedroom, squeeze yourself into a subway full of people who think it’s socially acceptable to sneeze into your mouth, and work overtime at a job that crushes what little bit of your dark, hardened soul you haven’t sold yet, but tonight…you’re a cool kid drinking PBR in an unauthorized area. Chic! Whatever you do, please stay away from the edge. Making it to the top isn’t worth falling off the edge. Irene Fagan Merrow is a Brooklyn-based writer and comedian. She performs her comedy regularly across all five boroughs and is very tired. She previously wrote about bringing her notebook to bars.